The LA Unified School Board will meet all day today, starting at 9 a.m. with a closed door session. The agenda is here). But the fireworks don’t begin until 1 p.m., when the board will reconvene for its regular board meeting, open to the public, That agenda is here, with the supporting material available here. Front and center at the open meeting: the mechanics of how the district will spread out next year’s funding to schools. Also up: members of the teachers union are expected to appear full force (and wearing red), urging school board members to reject the 2 percent raise Superintendent John Deasy has put on the table. 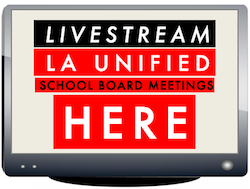 Follow our coverage on twitter @laschoolreport or click HERE for LIVESTREAM coverage.